Over 10% of UK libraries are currently under threat. Library closures and cutbacks are a serious problem. More than 400 libraries have closed in Britain in the last five years due to budget cuts, technology, and the internet age. This is why I dedicate my time to visit London Libraries during the Half Term Holidays. I feel that libraries are important places. Not just for children, but for everyone, and I want to help keep them alive and buzzing! They are places for the community to gather and take part in all sorts of fun and educational events as well as enjoying the many books libraries have to offer. 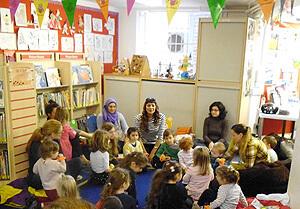 I have built up good relationships with London Libraries and I am often invited to do Story Time with the children in the holidays. It is such a pleasure for me to visit libraries! 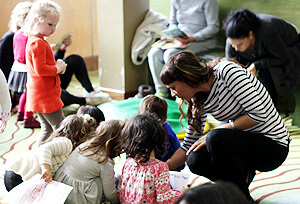 'Storytime with Anna-Christina' has become popular and sometimes parents queue up outside the libraries to take part in my fun sessions! For my first visit to a library, I use my interactive audiobook 'Billy Joins the Circus', as it is popular with nursery and preschool groups and great for encouraging everyone to get involved. I begin my Story Time with listening. 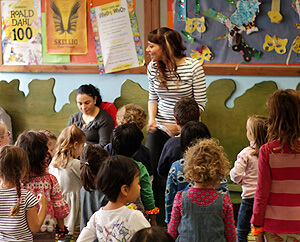 Children always enjoy the story and sit still whilst listening. 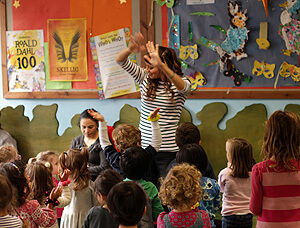 I like to keep them engaged the whole time, so I am animated and do some moves and gestures to keep them focused. There are a lot of details in my audiobooks to hear! 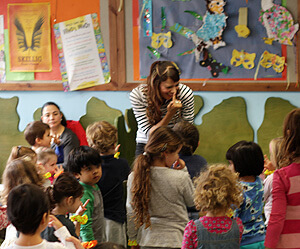 For very young children, the music keeps their attention. Listening to Billy Joins the Circus at West Hampstead Library. After we have talked about what we have heard in the story, I encourage the children to create their own drawing. For this particular story, I print out templates with the 'Big Top' in the middle of the page. This way, I can encourage older children to practice their colouring in skills, as well as teaching them more about "the big tent". 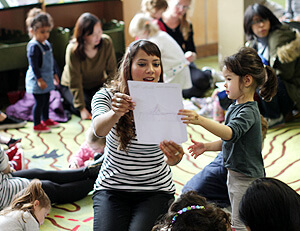 Drawing with the children at Swiss Cottage Library. Billy Joins the Circus is a great audiobook for encouraging children to sing and dance. It's a wonderfully energetic story with a strong message that dreams really do come true. The catchy song with instructions on movements such as clapping your hands, touching your toes, spinning around and jumping up and down is repeated three times enabling children to learn the song and the moves as they listen. Children absolutely love this and parents join in too! 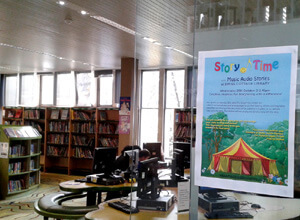 Singing and dancing with the children at Swiss Cottage Library. Through all of the fun during my Story Time session, I use my audiobooks to teach children valuable lessons. Specific lessons which certain audiobooks cover, as well as life lessons. 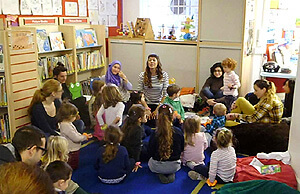 Library storytelling is great because it helps to promote social interaction and enables a child to develop self-confidence in a different environment. I love doing Story Time with the children! I do many sessions throughout the year at schools and nurseries but it's lovely to do Story Time with parents involved, as I also love to see how they react to my audiobooks! I'm pleased to see they are as popular with parents as they are with children! This makes me feel very happy! I am passionate about libraries and being part of family communities and therefore I offer my unique sessions to the public for free! Follow me on Twitter @StorytimewithAC, keep an eye out for 'Storytime with Anna-Christina' library events and join me for one of my musical, magical Story Times! Helping to change the world one smile at a time!